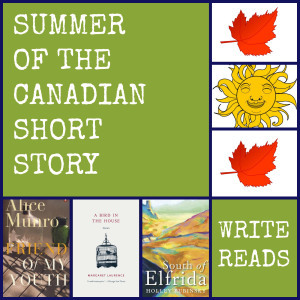 I am joining Tania @ Write Reads for her Summer of the Canadian Short Story reading challenge. This is the first short story collection I have read since starting my blog, and I chose Astray after reading Laura’s review on it at Reading in Bed. Astray is written by Emma Donoghue, who is well known as the author of Room and Frog Music. It is a collection of short stories about people who are, or have been, on the move. The best thing about these stories are the historical snippets at the end of each one, describing the records/letters/newspaper clippings that the author used as inspiration for her stories. I read through the book in no time at all, eager to find out what was coming next. It would be impractical for me to write about all the stories in the book, although I would like to. Some of her subjects and characters, spanning the past four centuries, include: Jumbo the elephant, a prostitute, Charles Dickens, swindlers, a run-away slave, murderers, emigrants, prospectors, orphans, a community of puritans, boy soldiers, and sculptors. Emma Donoghue has written an Afterword at the end of her book, telling about each story in her collection. I loved reading her views on each story, and what it was that intrigued and inspired her to write them. Donoghue feels that, being an emigrant herself has been one of the reasons why she has written so many stories about travel. I was surprised by how much I enjoyed reading these stories, and disappointed when I finished. I would recommend this collection to anyone looking for some short stories. Short story collections also make excellent bathroom books! I didn’t know how many books I would get read for this challenge, but after reading this one, I am excited to read another. The only problem is, there are too many to choose from! What are some of your favourites? Yay! So glad you enjoyed your first foray into the SCSS! Thanks for joining me and I’m glad you’ll be trying to add another book to the challenge. Though I haven’t read many, my fave Canadian short story books are One Good Story, That One by Thomas King and We So Seldom Look on Love by Barbara Gowdy (the Gowdy is a weird one, but a good one). I thought it was such a good idea to write stories based on historical bits of information, and then to let us know where the inspiration came from at the end of each story. I wonder if there is a similar collection out there somewhere? Thanks for the suggestions! Our library doesn’t have the Gowdy book (Boo! ), but it does have the one by Thomas King. And, right now I am reading (among other things) Moral Disorder by Margaret Atwood. I had that one on my shelf, and I have never read any of her short stories before. I think I’ve only read a couple of Atwood’s short stories. Hope it’s a good read! Amazing! I’m not very well-read in terms of short stories either but I did really enjoy One More Thing by B.J. Novak and I really liked Brief Interviews with Hideous Men and The Girl with Curious Hair by David Foster Wallace (they’re both short story collections). I’d say give any of those a try if you haven’t already! I’ll keep my eye out for Astray. Thanks for the suggestions! I will look them up! I might try squeezing this book in this summer. I also like when authors tell you what their inspiration is for writing the story, so it’s great that information is provided for you in the book. I can’t remember, did you read Frog Music? No, I haven’t read Frog Music, but I just read Room (because I’ve owned it for so long). I think my review for it will be ready for tomorrow. Astray went by way faster than I expected it to. The stories were pretty short, so they were easy to fit in here and there. I was excited about the challenge, because I always want to read more short story collections, but keep putting them off in favour of novels. After the challenge, maybe I’ll feel like I’ve caught up a bit. Or, maybe I’ll keep going! You can keep it in mind for next year! I would really love to read more short stories as well. I assume you have read Alice Munro? I need to read more of her. And Flannery O’Connor is another famed short story writer whom I haven’t really gotten to. My favorite short story writer right now is Jhumpa Lahiri. Her protagonists tend to be Indian or Indian American immigrants but her themes of trying to connect (with spouses, children, community, etc.) and feeling isolated are universal.